Can Japan Clean up Outer Space? Japan is forging ahead in the increasingly important field of space debris removal. Symbolized by the U.S. House of Representatives-backed bill to propose the creation of a new Space Corps branch and the presidential executive order to revive the National Space Council, space has gained a lot of attention in the political and security discussions in the United States. Likewise, competition has heated up in the space development market. In the satellite communication sector, SpaceX and OneWeb compete against each other in their plans to launch thousands of low-earth orbit satellites to provide globally affordable internet services and solve the internet-access gap. One of the most significant challenges of these space developments, regardless of public or private efforts, is space debris management. The European Space Agency (ESA) estimated that there are 150 million objects in space larger than one millimeter (0.04 inches). About 750,000 of these are as big as one centimeter (0.4 inches) and moving at the speed of bullets. The International Space Station has already experienced near misses with space debris multiple times in its history, and in May 2016, a small object hit the station and caused a small crack in the window. These objects not only damage existing spaceships and satellites but could also negatively affect the planning and operation of space activities for generations. The amount of space debris is anticipated to grow dramatically in the near future for two reasons. First, the growing competition in space will drive more actors to launch satellites and spacecraft in next couple of years. 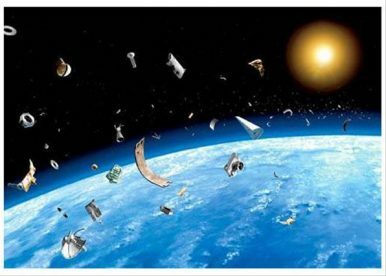 Eventually, we will have a larger number of objects or potential debris in space, especially in the already crowded low-earth orbit. Second, as the collision of a U.S. commercial satellite and a Russian military satellite in 2009 eloquently demonstrated, a crash between two objects can easily generate thousands more pieces of space debris. A scientist from the National Aeronautics and Space Administration (NASA) simulated a scenario proving that a certain density of space debris can trigger a cascade of further collisions, and created objects will eventually block one or more orbits from future space activities (the so-called Kessler Syndrome). It is estimated that China artificially generated about 150,000 pieces of debris in 2007 when the country destroyed its weather satellite during an anti-satellite missile test. Effective space debris management is achieved by the parallel efforts of mitigating the creation of new objects and removing existing ones. While the former is often driven by political and policy discussions among states, the latter is currently led by space development organizations such as ESA and NASA that develop technologies and methods for active debris removal (ADR). Christopher Daniel Johnson of the Secure World Foundation categorized the major technologies of ADR into three types: push, pull, and contactless. Push technologies seek to catch and collect debris with certain methods such as robotic arms. Pull technologies are designed to pull space debris into the atmosphere and burn them. Contactless technologies utilize lasers or ion beams to sweep junk in orbit. Among the many research agencies and companies in the world developing different ADR technologies, Japan pursues all of the three above types. For instance, Astroscale, a venture company founded by Japanese entrepreneurs in Singapore, is known as the first private company in the world attempting to tackle the space debris issue. Astroscale’s push technology is designed to physically reach out and collect space debris by utilizing small catcher satellites attached to a space station or spacecraft. In addition to the fact that the company’s further success could eventually contribute much to solving the global space junk issue, it could also motivate Japanese society to welcome an infusion of entrepreneurial spirit to its risk-averse culture and facilitate the government’s improvement of its policy and system to support start-ups. On the public side, the Japan Aerospace Exploration Agency (JAXA) is pursuring pull or special tether technology. The special tether, which is based on a fishing net manufactured by a long-established Japanese company, is designed to reach out and drag space debris into the atmosphere. Despite the fact that its field test ended in failure in February 2017 due to technical difficulties, JAXA scientists aim to try again. Finally, Riken, a government-funded research institution in Japan, has coordinated with universities and research institutions overseas to pursue contactless laser technology to remove space debris. This specific technology targets small but dangerous space debris and drags them into Earth’s atmosphere to burn them up. The research group hopes to equip the International Space Station with the system and conduct real-world tests in the near future. While ADR should be conducted to minimize the risks and costs of future space development, there are legal, political, and economic challenges. Article VIII of the Outer Space Treaty of 1967, one of the most basic international frameworks of space law, states that any object in space, regardless of whether it is an active satellite or space debris, belongs to the nation that originally launched it. This law makes ADR by a third party without consent from the owner nation difficult. Additionally, Mitsunobu Okada, CEO of Astroscale, points out the lack of public understanding of the risks of space debris as another issue. It is challenging for Okada to convince investors and potential customers to pay for the costs of ADR if they see the service as a type of garbage collection. Okada thus seeks to educate them as well as the general public of the scale of economic damage that could be created by space debris. Space debris management can be an area for Japan to technologically and politically lead related discussions on the world stage. Because the problem needs to be solved to continue expanding human activities in space, taking a leadership role in ADR will eventually help Japan improve its presence in the fields of space development and diplomacy, as well as in the broader security realm. Furthermore, for the central government of Japan, how effectively and efficiently Astroscale is supported can be a touchstone of its ability and capacity to assist local entrepreneurs and stimulate the stagnated economy for further development. The joint research agreement signed by Astroscale and JAXA in September 2017 is a good start. Mayuko Yatsu is Project Manager/Senior Research Analyst at Washington CORE, L.L.C., an independent research and consulting firm located in Bethesda, Maryland. The government and local startups are racing to get the first Japanese technology to the moon. Japan's Defense Policy Decisions in 2018US-Japan Trade Agreement Negotiations: Why Now?Is Japan Anti-China?Japan’s New Imperial Era: What’s in a Name?South Korea and Japan: Where to From Here?